Garrett Graham‘s tenure with the Broncos will end without him even taking the field. Cameron Wolfe of The Denver Post tweets that the team has released the veteran tight end from the injured reserve. Graham signed with Denver back in April, and he was placed on season-ending injured reserve in late August. Graham, a former fourth-round pick out of Wisconsin, had spent the entirety of his six-year career with the Texans. The 30-year-old started 31 games during his time in Houston, hauling in 100 career receptions. His best season came in 2013, when Graham caught 49 passes for 545 yards and five touchdowns. This performance earned the tight end a three-year extension with the squad. Graham played in eight games last season, finishing with four catches for 30 yards and one score. The team is presumably content with the trio of tight ends on the active roster. As Roster Resource shows, the Broncos will rely on Virgil Green, Jeff Heuerman and John Phillips for production from the position. Another member of the Broncos’ Super Bowl winning team has left Denver. Punter Britton Colquitt was among the players released today, according to a team announcement. As a vested veteran, Colquitt is free to sign with any club and is not subject to waivers. Rookie Riley Dixon now figures to be the Broncos’ punter in 2016. Colquitt has been with the Broncos since late in the 2009 season and was the Broncos’ longest-tenured player. Now, 2010 first-round pick Demaryius Thomas stands as the longest-tenured player in Denver. Colquitt’s agent tells Mike Klis of 9NEWS (on Twitter) that he was willing to take a $1MM cut from his $3.25MM salary. Last year, he accepted a pay cut from $3MM to $1.6MM. Yesterday, it was reported that the Broncos were gauging trade interest in Colquitt. Apparently, Denver could not find any takers. The Vikings, Cardinals, and Bears are among the teams that could show some interest in the punter now that he is available. The Broncos also waived offensive tackle Kyle Roberts and wide receiver Bralon Addison. Tight end Garrett Graham has been placed on season-ending IR. The Broncos are signing free agent tight end Garrett Graham to a one-year contract, reports Ian Rapoport of NFL.com (via Twitter). After signing Owen Daniels in 2015, Gary Kubiak‘s team is adding a former Texans tight end to its roster for the second consecutive year. 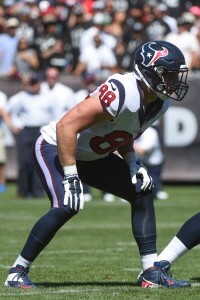 Graham, 29, joined the Texans as a fourth-round pick in 2010, and after playing sparingly in his first two seasons, he emerged as a weapon in the passing game in 2012. His best season in Houston came in 2013, when he caught 49 balls for 545 yards and five touchdowns. Graham’s 2013 performance earned him a three-year, $11MM+ extension in 2014, but that new deal coincided with the departure of Kubiak in Houston and the arrival of new head coach Bill O’Brien. The Wisconsin alum was never an ideal fit in O’Brien’s offense, and saw his role reduced over the course of the last two seasons. In 2015, he fell behind C.J. Fiedorowicz and Ryan Griffin on the Texans’ depth chart, leading to his eventual release. With Daniels no longer in the tight end mix in Denver, Graham will join a group that includes Jeff Heuerman, Virgil Green, and Richard Gordon. The former Texan should have the opportunity to compete for a roster spot and perhaps regular playing time as well. 11:57am: The Texans have now released safety Rahim Moore in addition to Graham, tweets John McClain of the Houston Chronicle. As noted below, this move was expected, and creates more than $2MM in cap savings. 10:16am: After parting ways with longtime running back Arian Foster this morning, the Texans are continuing to make roster cuts. According to Ian Rapoport of NFL.com (Twitter link), the club has now released tight end Garrett Graham. Graham, 29, has seen his role in Houston decrease since an impressive 2013 campaign in which he caught 49 passes for 545 yards and five touchdowns. In 2015, he was the Texans’ third tight end behind C.J. Fiedorowicz and Ryan Griffin, recording just four receptions for 30 yards and a TD in eight games. With the Texans progressively phasing him out of the offense and his cap hit approaching $4MM, Graham looked like a logical release candidate. By cutting him, Houston will clear his $3MM base salary and his per-game roster bonuses from the team’s books, creating $3.125MM in cap savings and leaving $750K in dead money on the cap. In the wake of the Foster move, several Texans beat writers, including Aaron Wilson of the Houston Chronicle (Twitter link) suggested that Graham and safety Rahim Moore would be next to go. There’s nothing official on Moore yet, but if and when he’s released by the team, that would create another $2MM+ in cap room. Moore signed a three-year, $12MM contract with the Texans just a year ago, but his first – and likely only – season in Houston was a disappointment, as he lost his starting job to Andre Hal halfway through the year. When Cowboys‘ superstar Dez Bryant hits free agency, he wants to be paid like one of the top five receivers in the NFL. Shaun O’Hara and Willie McGinest of the NFL Network argued over whether the young wideout is deserving of that payday, transcripted by DallasNews.com. Chargers‘ offensive tackle D.J. Fluker is eyeing the Pro Bowl in his sophomore season, writes Michael Gehlken of UTSanDiego.com. Fluker has been boxing to get into shape this offseason, and is poised to avoid decline in his second year. Texans‘ head coach Bill O’Brien plans on using three tight ends in his offense, and will give all of them a chance to shine, writes Brian T. Smith of the Houston Chronicle. O’Brien started the tight end trend with the pairing of Rob Gronkowski and Aaron Hernandez in New England, and could continue to see success with the Garrett Graham, Ryan Griffin and rookie C.J. Fiedorowicz. 4:14pm: The Texans have officially re-signed Graham, the team announced today in a press release. 1:16pm: Graham’s new three-year deal is worth $11.25MM, according to ESPN.com’s Adam Caplan (via Twitter). 11:27am: The Texans have agreed to terms on a new deal with tight end Garrett Graham, according to John McClain of the Houston Chronicle (via Twitter). According to Mark Berman of Fox 26 Houston (via Twitter), it’s a three-year contract. Graham, 27, had a breakout year for the Texans last season, hauling in 49 passes for 545 yards and five touchdowns. He started 11 games for the team in 2013 after an injury to Owen Daniels created an opening. With Daniels having been released earlier in the offseason, Graham looks poised to assume the role of No. 1 tight end in Houston, with Ryan Griffin backing him up, tweets James Palmer of CSNHouston.com. It looks like many of the top offensive tackles will fly off the shelves early when free agency gets underway at 3:00pm central time this afternoon. Branden Albert appears to be headed to Miami, while Anthony Collins will likely sign with the Bucs, and Eugene Monroe and the Ravens should work out a new deal. That leaves the Cardinals as the logical landing spot for Jared Veldheer, and Jason La Canfora of CBSSports.com says (via Twitter) GMs and agents are essentially viewing that as a done deal, turning their attention to Rodger Saffold and other players. As we wait to see if Arizona can officially lock up the Raiders’ free-agent-to-be, let’s check out a few more updates from around the NFC…. The Packers were “very interested” in defensive end Lamarr Houston, but appear likely to bow out of the bidding as his price tag increases, says Tom Silverstein of the Milwaukee Journal Sentinel. It doesn’t sound as if things are heating up between Jairus Byrd and the Redskins at the moment, according to Mike Jones of the Washington Post, who hears from a source that the two sides are just having “casual conversations” (Twitter link). The Lions have been in recent contact with defensive end Willie Young’s agent about a new deal, but Young looks set to hit the open market and should have a handful of suitors, writes Dave Birkett of the Detroit Free Press. The Falcons are trying to lock up center Joe Hawley to keep him from reaching the open market, but there are other teams interested in him, according to Adam Caplan of ESPN.com, who says (via Twitter) talks might go right up to 3:00pm today. Tight end Garrett Graham could be a target for the Buccaneers, tweets Pat Yasinskas of ESPN.com. As they did a year ago, the Eagles could strike quickly in free agency today, writes Zach Berman of the Philadelphia Inquirer. A quick look at the latest out of Houston..
Owen Daniels wants to remain with the Texans and is willing to restructure his contract if neccesary, tweets Brian T. Smith of the Houston Chronicle. Daniels is entering the final year of his deal with Houston. Teammate Johnathan Joseph, who has a cap number of $11.25MM in 2014, is also open to restructuring his deal with the Texans, tweets James Palmer of CSNHouston.com. However, the club hasn’t approached him to rework his contract just yet, Tania Ganguli of ESPN tweets. Garrett Graham said the Texans told him they want him here but that the process has been slow, Ganguli tweets. Meanwhile, several teams have shown interest in the 27-year-old tight end. No NFC North teams used their franchise or transition tags yesterday, meaning players who looked like candidates, such as Packers cornerback Sam Shields and Lions tight end Brandon Pettigrew, appear likely to hit the open market next week. While we wait to see if those players work out anything with their respective teams, let’s check out the latest on the Bears, Lions, and Packers…. Defensive lineman Corey Wootton is still rehabbing from hip surgery, but he expects to be fully healthy by July, as he tells Adam L. Jahns of the Chicago Sun-Times. Although Wootton says he’d love to return to the Bears, the 26-year-old expects to “test the market and see what’s out there” in free agency. Assuming teams are confident in his full recovery, Wootton should receive plenty of interest beginning next week. While he thinks the Bears could consider free agent safeties T.J. Ward and Jairus Byrd if the price is right, Patrick Finley of the Chicago Sun-Times hears from a source that the club has not expressed any interest in Louis Delmas. $370K of Roberto Garza‘s potential $1.5MM salary for 2014 is tied to weekly roster bonuses, so the Bears have a little built-in injury protection on their center, says Brad Biggs of the Chicago Tribune. Because first-round picks don’t cost as much as they did under the old CBA, GM Martin Mayhew and the Lions are comfortable taking the best player available at No. 10 rather than feeling pressure to take someone at a key position, as Dave Birkett of the Detroit Free Press details. In a separate piece for the Free Press, Birkett looks at a few Detroit free agents, writing that the Lions continue to work on a new deal for Pettigrew, but are comfortable letting him test the market next week if no agreement has been reached. The Texans are talking to tight end Garrett Graham about a new contract, but if the team lets him reach the open market, the Packers will have interest, according to Ian Rapoport of NFL.com, who says Green Bay has liked Graham since he came out of Wisconsin in 2010 (Twitter links).